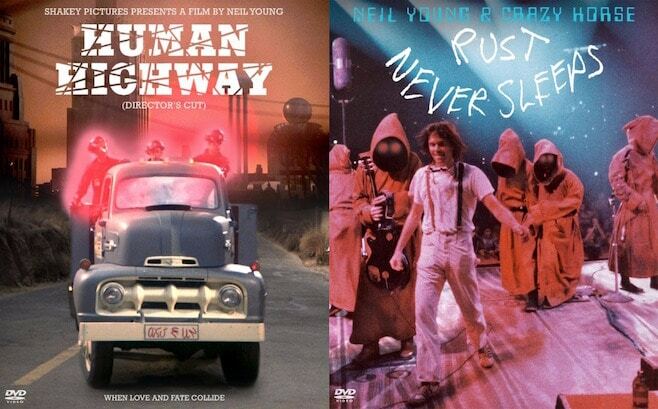 Neil Young won’t deliver Decade 2 or perhaps 3 and has pulled his music off most streaming services, but opens his video vaults for these two re-issues. Both have been spiffed-up with restored, substantially improved video (they are available in regular and Blu-Ray formats) and enhanced audio, the latter particularly evident in the Rust Never Sleeps filmed concert. It may go without saying, but the Rust Never Sleeps show, filmed on a single performance at San Francisco’s Cow Palace on Oct., 22, 1978 is the gem here. Although the audio CD was serviceable (at least for its 1979 release), the original DVD was a grainy, dimly lit, muddy muddle that, because it caught Young and Crazy Horse in a now legendary, phenomenal performance, most music fans were willing to live with. This restored version is abundantly better both audibly and visually, albeit with the deep red lighting in many parts still resulting in a blurry picture that even Blu-Ray can’t help. The half hour or so of time devoted to the “road eyes” scurrying around stage (with an annoying clicking of heels that seems to be louder and more prominent than it should be) along with Woodstock stage announcements and the playing of Hendrix’s version of the “Star Spangled Banner” remain artsy, somewhat pretentious distractions from the bulk of the gig. But anyone who has not yet witnessed the intensity of this outfit slashing into a searing, hot-wired “Like a Hurricane” with fans blowing Young’s hair as he tears off sizzling licks on his famous “black beauty” Gibson guitar, really needs to pick this up immediately. It’s almost life altering. You’ll forgive the indulgencies when you see Young shifting from solo acoustic mode reprising his Buffalo Springfield era “I Am a Child” to a closing, riveting “Tonight’s the Night” with Crazy Horse pushing him to new heights. It’s a breathtaking show and the upgraded version blows the previous one away, especially in stunningly and very alive (there appears to be no overdubs) remastered 5.1 audio. What you are less likely to forgive is Young’s rightly forgotten excursion into movie satire with the uneven and amateurish 1982’s Human Highway. A potentially stimulating cast led by Young, Dennis Hopper, Dean Stockwell (who co-wrote and directed with Young) and Devo can’t do anything with this woefully unfunny, unfocused mess. This disaster attempts to parody pop fame, nuclear waste, movie musicals and about a dozen other topics by laying the slapstick, awkward dialog and cut-rate visual effects on so thick, it makes The Rocky Horror Picture Show look like Gone With the Wind. At a relatively brief (but seemingly interminable) 80 minutes, which includes a few interesting and rare tunes like Devo’s version of Young’s “Hey Hey My My (Into the Black”), this still feels too long. And Young fanatics might find that once is too much watching Neil throw his money away on the very definition of a vanity project that this edition’s enriched audio and video does little to make more palatable.